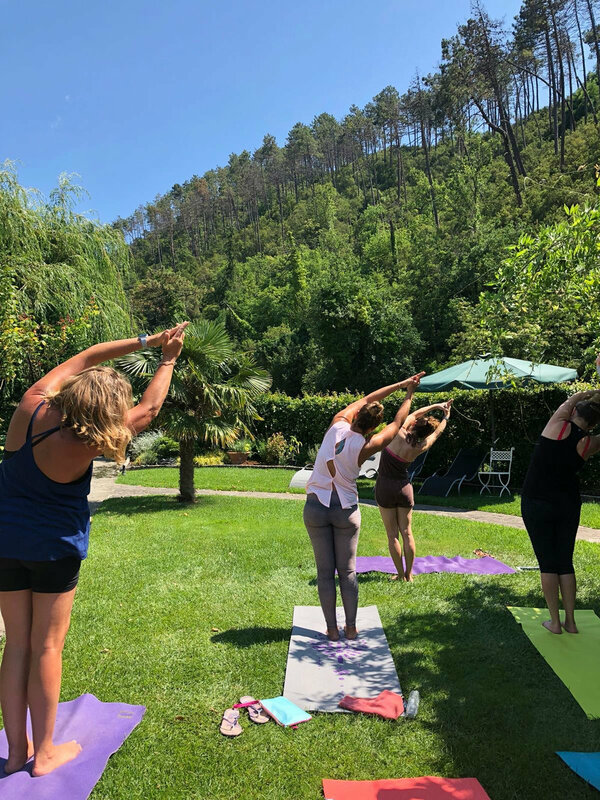 Sole Yoga Holidays is so thrilled to return to our Luxury Retreat along the Italian Riviera in the glorious region of Cinque Terre, Italy, June 2020. Here along the Ligurian Coast is some of the most dramatic coastal scenery on earth! Cinque Terre, or ‘five villages‘ is comprised of colorful houses and vineyards that cling to steep terraces and harbors filled with fishing boats and beaches dotted with candy-colored umbrellas. The Sentiero Azzurro cliffside hiking trail links the villages and offers sweeping sea vistas. It truly is one of the most heavenly places for a summer yoga and wellness retreat! A delicious and hearty breakfast is included daily at our wonderful location. Fresh fruits and juices, eggs made-to-order, cheeses, local breads and heavenly sweets are all part of our daily post-yoga meal. We have included a variety of other delicious dining! Our Welcome Dinner is a special pizza party. Homemade pizzas, fruity sangria and big bowls of crisp salad. We will enjoy a special dinner together in town, dining on heavenly, local specialities. And finally, our last evening is a very exciting Farewell Dinner and local wine & prosecco with views to die for! Plus, delicious seafood on our boat excursion and a pesto cooking class with tastings. Twice per day (except boat day and shopping day, when we practice once per day) we will practice yoga outdoors with the sounds of only the sweet birds to accompany us! Your host, Shari will guide you through a vigorous vinyasa flow and during the week we will also include a yin and restorative session post-hike. As always, Shari will listen to what the group needs and adjust accordingly for the best yoga experience! SUNSET BOAT & APERITIVO: Reserved exclusively for our villa, a boat tour along the picturesque coastline of the Cinque Terre is a must-see, especially at sunset! Our captain and guide, Angelo is a 10th generation fisherman from Monterosso. We can’t wait to hear his stories and love for the Cinque Terre. We will also share a wonderful aperitivo of seafood, pasta and wine in the beautiful town of Vernazza. VINTAGE SHOPPING 1/2 DAY: Time to shop till we drop! We will explore a local town and all of the hidden gems by a local expert. Time to find that perfect pair of Italian-made shoes or exquisite antique piece for your home. We will go to the secret spots and find the most wonderful treasures to take home! **Transportation pick-up/drop off from Levanto Train Station included, day of/departure dates only. Other options will be provided outside of pick-up and extra fees may apply. Arrival & departures times will be released closer to retreat dates. Let us know if you need additional help in arrival and departure. Travel insurance is recommended for this retreat. PLEASE consult your travel agent for the best policy. Upon booking, other information will be provided including packing lists, and other important info on Cinque Terre. Feel free to download our FAQ's on travel, etc here.